This Article is reproduced With Written Permission from CardBhai.Com. In continuing our tradition to source authentic data and present it to you, we have published the breakup of Debit Card and Credit Cards in circulation in India at the end of Dec 2014. It gives me immense pleasure to state that Total Debit & Credit Card Penetration in India has touched a whopping 520 Million / 52 Crore [1 Crore = 10 Mn] at the end of 2014, half the size of Indian population, still less than the 97 crore mobile connections India has. Data from the above chart suggests that Credit Card user base is very minute compared to Debit Cards issued as Indians are still learning the value of availing responsible credit aided by the Credit Bureaus such as CIBIL. What comes as a surprise to us is the total spend using Plastic Money at Point of Sale [PoS] and eCommerce. Credit Card users are heavy spenders at PoS & Online as mere 2 Crore Credit Card holders spend a whopping 17,186 Crore while 50 Crore Debit Card holders spent a meager 11,101 Crore. 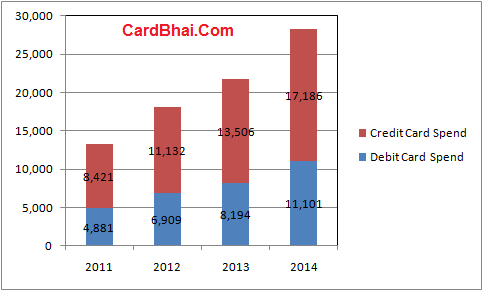 The Following Chart Shows the Total Amount Spent in Rs Crore at PoS / Online by Debit vs Credit Card Holders in India. HDFC Bank Continues to be the Top Credit Card issuer in India with 5.7 Mn Cards and the portfolio is immensely profitable to the bank, of course with unrealistic Late Fees & Over the Limit Fees practice somewhat unethical & unacceptable. 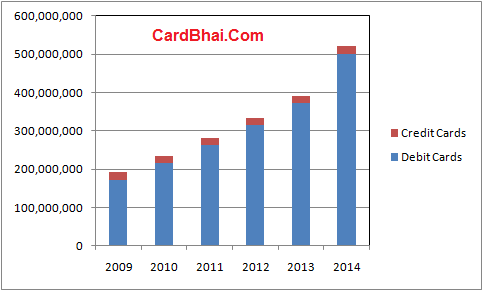 ICICI Bank is the second largest card issuer with 3.2 Mn cards at the end of 2014. The Gap between the Top 2 is somewhat very high and it is likely that HDFC will continue to be the leader in this segment for 2015 as well.